Happy Friday! I am so looking forward to the weekend, and spending some quality time with Matt and my two girls, Minda and Kaya. Kaya is almost two months old, and she always wants to be held. Since she was born I have been carrying her around in a traditional front baby carrier which is fine, but it kills my back after a couple of hours. Matt’s cousin has had three babies and has always used a wrap that she makes herself, so when Matt’s mom gave me the specs on how to make one I thought I would give it a try just to have something extra around to put Kaya in. I cannot believe I didn’t do this sooner. It is so much more ergonomic, and really has taken the strain off of my back. I also love that it does not have any clasps that can accidentally come undone, which has happened a time or two with the other carrier. It is also much easier to stroke and soothe baby when she needs it, and if Matt needs to carry her, he does not have to readjust the straps. The best part is it was quite possibly the easiest DIY ever. There is no sewing involved. If you can cut a fairly straight line then you can make this baby carrier. For the wrap you will need 4-6 yards (depending on your size) of 100% cotton jersey knit interlocking fabric, a measuring tape, a pair of scissors, and a permanent marker. Finding the right fabric was the hardest part of the project for me. I really wanted a solid color, but the fabric store I went to only had polyester knit solids which is not breathable, so I would not recommend it for this purpose. You will be able to tell that it is an interlocking fabric by looking at the edges. Edges on interlocking fabric roll and do not fray, so you do not have to sew the edges of the wrap. After I finally found a fabric that I could live with, I had it cut to 4.5 yards (actually it was meters, but it is a pretty close conversion) because I am pretty small, and my wrap fits fine, but if you are in doubt about how much to get, I would suggest getting at least 5.5 to be sure. Lay the fabric out on a flat surface, I did mine on the floor. It looks like a ton of fabric, but don’t be intimidated. Measure your fabric width. 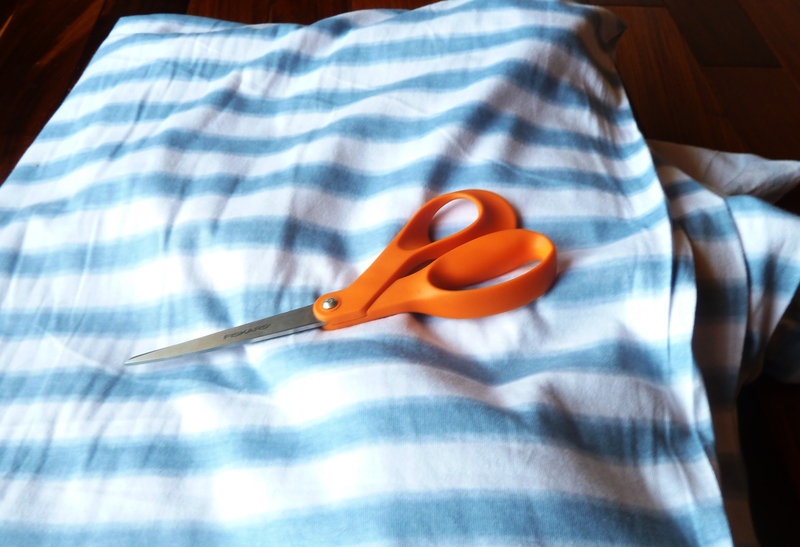 If it is 60” across then simply fold it in half and cut along the fold. If the fabric is a shorter width, then measure 30” and make a mark with the marker, do this the entire length of the fabric every 6 inches or so, so that you will have a pretty straight cut. After cutting the fabric take the piece that is 30” wide (if you have two pieces this width or greater, congratulations, you have two wraps!) fold it in half length-wise. Make a mark in the center so that you will be able to find it easily when you are ready to wrap it, or if you wanted to get fancy you could sew a button here. Now your wrap is ready, see I told you it was easy! 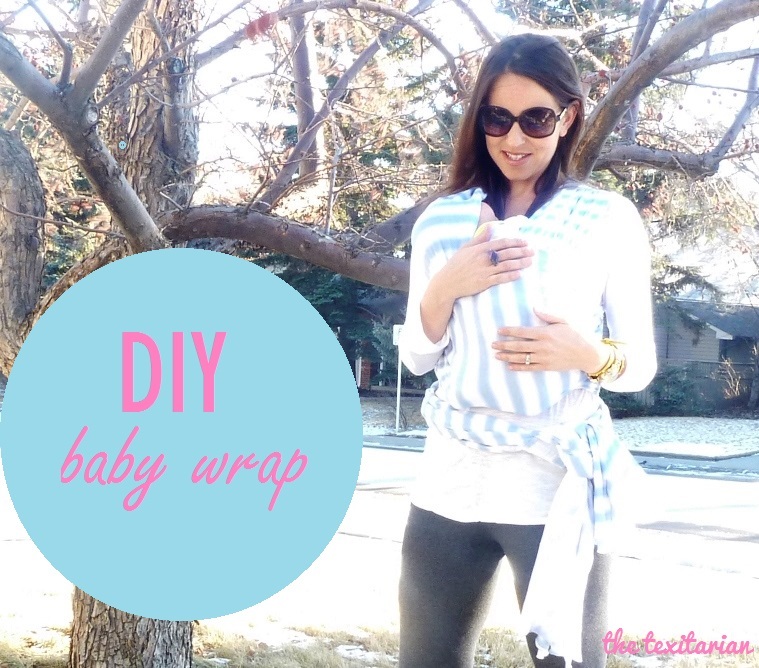 I found instructions online for how to wear the wrap here: http://www.mobywrap.com/t-instructions.aspx. Now your hands can be free to cook, or do whatever you love, and your baby will be happy to be next to you!